blogComments Off on Control4 Single Room Bundles! Control4 Bundles, Here They Are! We recently announced on our social media feed that we would be packaging some Control4 bundles together. These bundles are able to offer a single room installation at a bargain price. Well here they are! This is a perfect start into the world of Control 4 smart home systems. and is something that can be expanded upon at any time. It’s important to note that this is NOT just a programmable remote for your TV. It’s a fully featured Control4 system that uses the latest EA1 system processor. The idea of these bundles are to allow you to benefit from a Control 4 system in just one room of the house. (Most likely the room with the most audio visual equipment). Each of the three bundles offered below includes full installation. This includes the initial set-up, programming and user training. The offer is valid within a 30 mile radius of Northampton. If you are further away we will still honour the bundle price, but charge a small fee for traveling time. 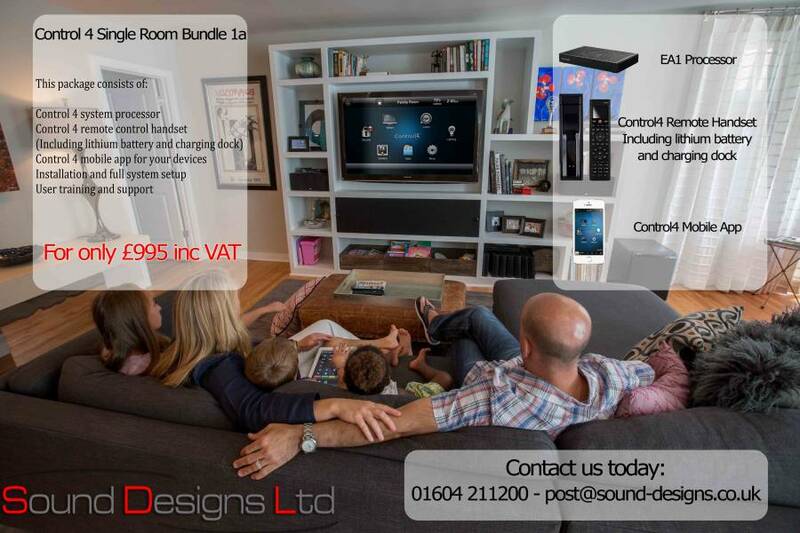 Sound Designs Ltd are a Control 4 authorised dealer and a Cedia member (Custom Electronic Design & Installation Association). We have been in business offering audio visual services since 2005. Sound Designs are not an electrical contractor, or security installer trying their hand at ‘something new’. 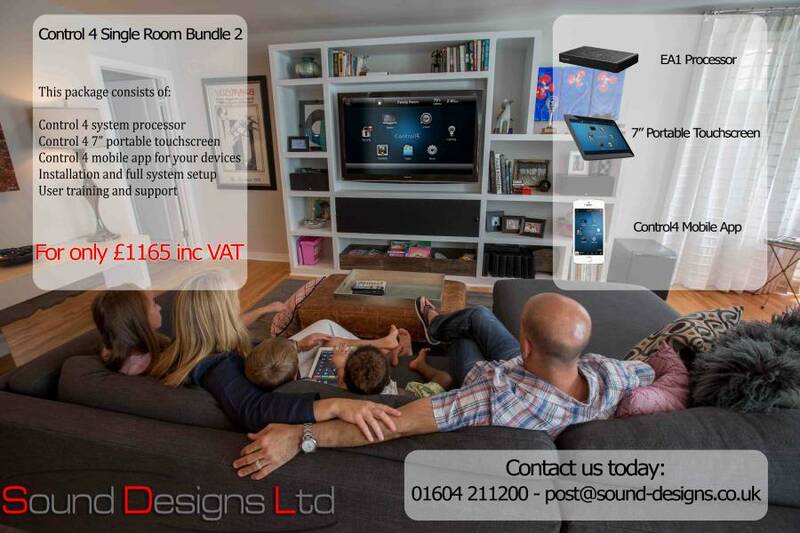 We are a specialist AV installer offering the very best products and services in the industry. In the above example there would be four remote controls. These would be replaced by just one Control 4 interface. The SR260 in the case of bundle 1 and 1a, or the 7″ mobile touchscreen with bundle 2. The same user interface will also be available on mobile devices and the TV itself. The Control4 processor takes control over the above devices in order to offer a single user interface for control and also to automate some functions. Most devices are controlled either via infra-red where the controller emits a light signal that mimics the device’s own remote control. Other devices use IP commands sent via your internet router to the device as a form of network control. The level of control available is dependent on the device and how easily it integrates. Devices with no level of control are incredibly rare. The Sony TV – Controlled via either IP or infra-red depending on it’s model and year. The Sky HD Receiver – Controlled via infra-red. The bluray player – Controlled via infra-red. The AppleTV – Controlled via IP. The Sony PlayStation doesn’t have any direct control. However the TV will switch on to the correct input. The Yamaha amplifier – Controlled via IP. Having all devices controlled by the Control4 processor means that certain tasks are automated. As an example, watching Sky TV uses just two button presses. The Control 4 processor would handle turning on all relevant equipment and changing settings to suit. Once powered up, the Control 4 remote becomes the Sky remote for you to surf your favourite channels. Switching the system off is even easier with a single button push! 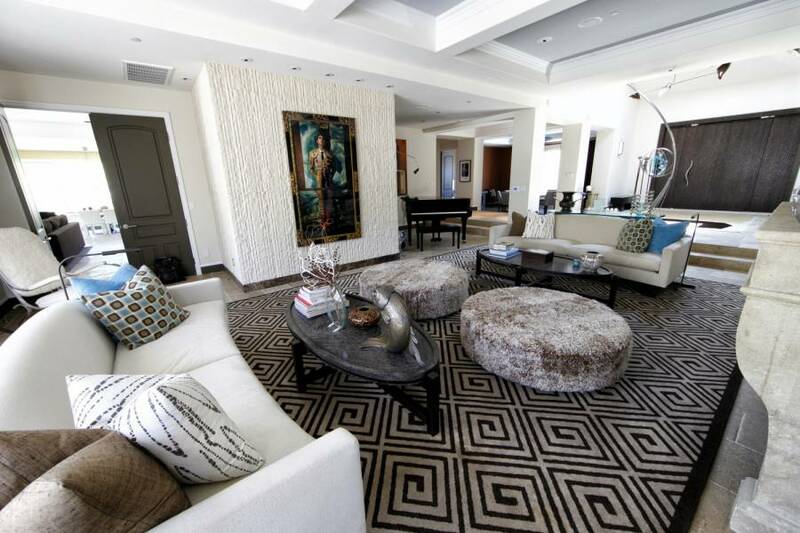 Every living room is different and differing combinations of equipment will change how the system is installed and set-up. However Control 4 as a system is able to integrate with thousands and thousands of products. So whatever your audio visual set-up, the system will make your living room life easier and your viewing more pleasurable. Bundle 1 consists of an EA1 processor, SR260 handheld remote control and installation of the mobile app on your devices. 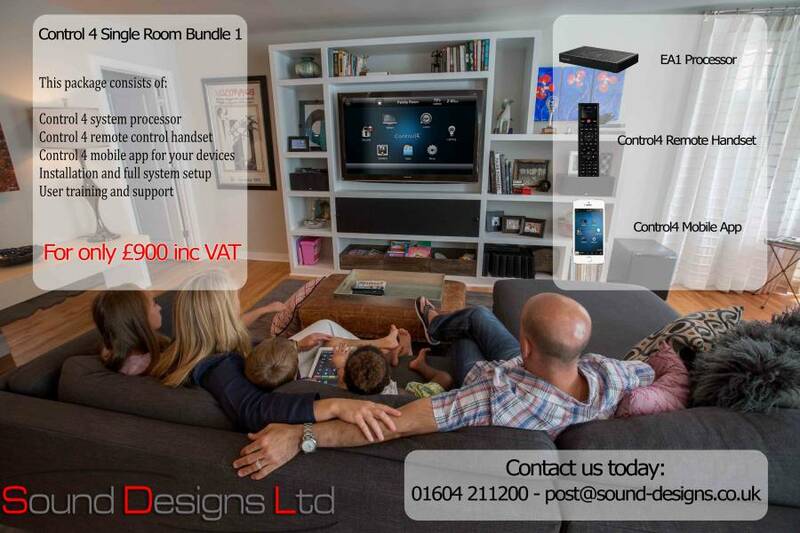 The system is installed and programmed to control up to 4 infra-red devices in your living room and unlimited IP controlled devices (Subject to driver availability). A Control4 customer account is created and full user training given. Bundle 1a has all of the features of bundle 1 with the added benefit of a recharging station and lithium battery for the SR260 remote handset. Bundle 2 is an upgrade that replaces the SR260 with a 7″ full colour mobile touchscreen panel. This offers a fully graphical user interface that is always on, ready for action. The user interface seamlessly mimics the same user interface that is available on mobile devices and the TV.